Hello. Is it ok to apply the second coat days after the 1st? And is it generally advisable to do two coats on an older deck? Or can i reapply in the spring if it needs a 2nd coat by first brightening the deck after the winter? 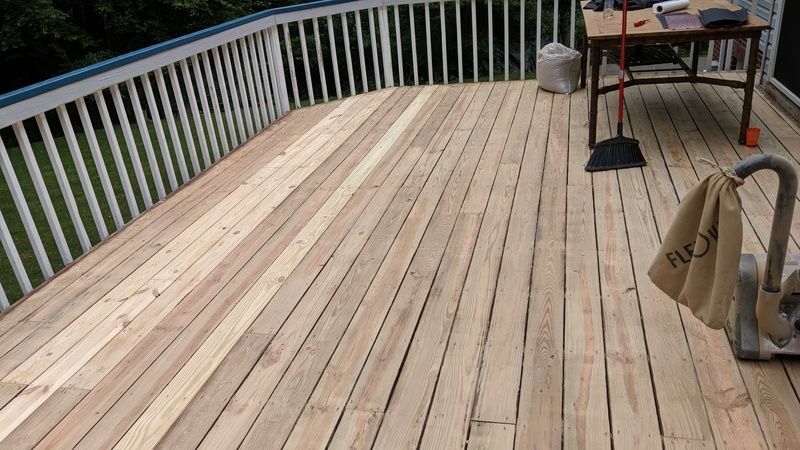 I have a large deck 15x50 and was wondering whether I can do a coat with 5 gal and check the coverage before ordering the 2nd bucket if needed. Would prefer not to sit on a $200 bucket of stain if I can get away with less. Assuming 2nd application will take a lot less? Maybe order 2 more gallons for the 2nd coat? For the two coats, you would need about 8 Gallons. Around 5 for the first and 3 for the second. it is best to do this wet on wet. If you wait until Spring, you will need more than three gallons for another coat. you would have to clean and brighten for the prep in the Spring, not brighten the wood. Awesome customer service! Such a quick reply! Many thanks. Keep it going. Amber is the lightest tint. We are going to apply your hardwood black walnut stain on new Ipe (decking and rails). How long do we let the wood age before applying? A 5-gallon will cover about 750 sq feet for one coat. The AC cannot be custom tinted but you can mix colors of the AC together. 4-24 hours is normal and varies based on temps and UV exposure. Hi what are the cure times? Ac semi transparent. After 24hrs deck still has oder and feels damp... Not wet. I had wanted to apply second coat for protection. Is 24hrs enough cure time? Should I wait longer? No issues with it adhering to itself? Depends on the wood type and age. Could be 1-7 days to fully cure. Adding more is not always needed nor will it make it last longer. Might want to leave as is for now and do a light coat in the Spring after a light water wash.
Hello. 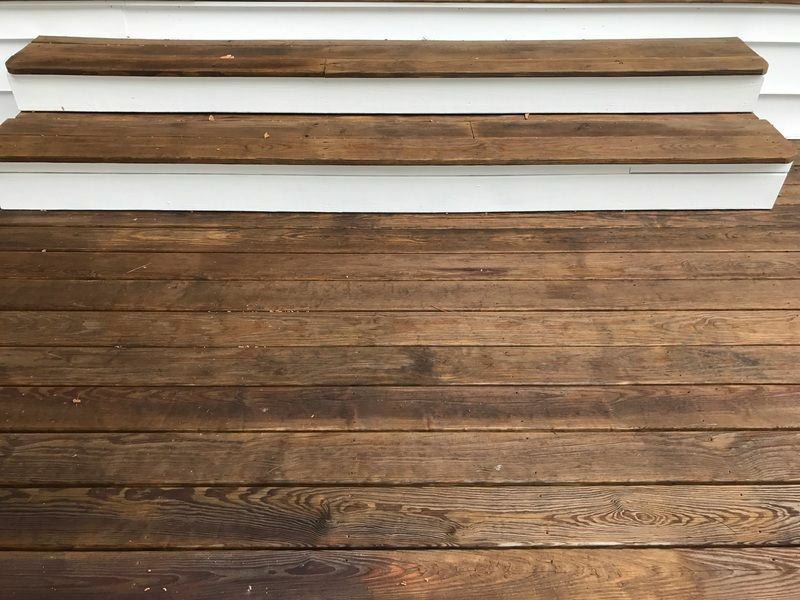 I applied driftwood stain to the stairs this afternoon and unfortunately, rained at night. When I got home, all the steps were wet so I wiped with a cloth. The areas that I started first must have been dried before the rain but most of them weren't since I could see mixed rain and stain on the cloth. I put plastic over after wiped off the water since it might rain again tonight. What should I do next? I'm assuming I need to reapply the stain once it all dries up but do I need to clean and brighten again or can I just apply the stain? Wait until the rain stops and the stain dries and cures before assessing if anything needs to be done or not. It may be fine. Thank you for your timely reply. After removing the plastic cover this morning, some areas were still wet. I wiped them off again and took a photo. I think I need to stain again bottom few steps. I will wait for few more days but could you please tell me if I can just apply stain or need to clean / brighter again? Just apply a very light coat to the area. Just completed applying oxford brown semi-solid stain on 2 yr. old PT wood. Stain is fantastic, easy to apply and looks beautiful. I had a couple of boards where either I applied too much stain or the wood would not absorb and there is a bubbly section of stain (see pic). Would sanding and then reapplying fix this or try to remove with mineral spirits? Just wipe off with rags and mineral spirits the excess stain Saturate all oily rags in water and lay flat to dry outside. I have a cedar deck that I have stained unsuccessfully 3 times now. Nothing will stick to it. I have stripped it once again. Your amberstrong-clark amber was recommended to me. I am afraid to stain it again. Why does this stain stick while the others don’t? Is it an oil? BTW I am going to sand it first. The AC is a penetrating oil. As long as you prep correctly and apply correctly, it will soak into the wood grain. For the prep, you should remove all old coatings fully. After the sanding, clean and brighten the wood for final prep. This will allow the stain to soak into the wood better. I have about 4 out of 5 gallons of your rustic brown stain left over. can i cover the top of the stain with some plastic wrap top keep it away from the air and store in original container? Plastic will not help to prolong cans that are already opened. Hi there. 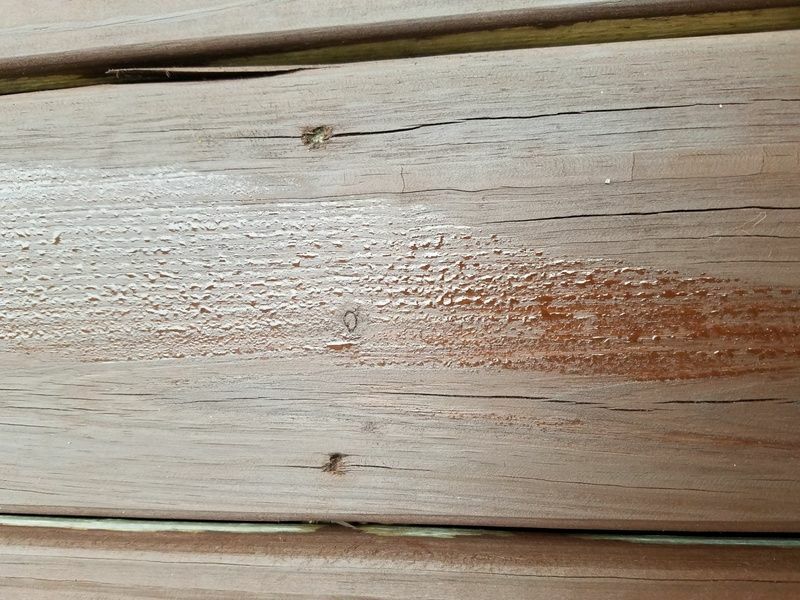 We live up in Ottawa Canada and I’ve had your stain on my deck for about 2 years now. I cleaned, brightened and restrained all the flat portions which were directly exposed to sun. My question is the main reason why I restrained was because on some parts of my deck it discoloured almost black, i used an amber semi. Do you have any idea why that was and what would you suggest a normal care tips? I broom farily often and spray, too. Would you suggest a stiffer bristled brush instead of a broom to get in the grains? Our deck is cedar. Thanks. Do you have pollen in the area? That is a known feeder or mildew. If the pollen lands on top of the stain, mildew may grow on top of the AC. The other option is just dirt landing on the deck from trees above. We have pollen but I’m not sure if it’s any more than usual. What would be a way to lessen or prevent the darkening? Try washing with soapy (dish sopay) water and a car wash brush every month. Not a question, more of a review and some pics that hopefully might be helpful to others with mahogany. I have a mahogany front porch and before using the product (Hardwood Stain) I was looking for some pics to help me choose my color. Understanding that mahogany can mean a few different species, I looked for a while to find some pics to help me choose. I couldn't find any so perhaps this will be helpful to someone. I used the Hardwood Amber stain product. 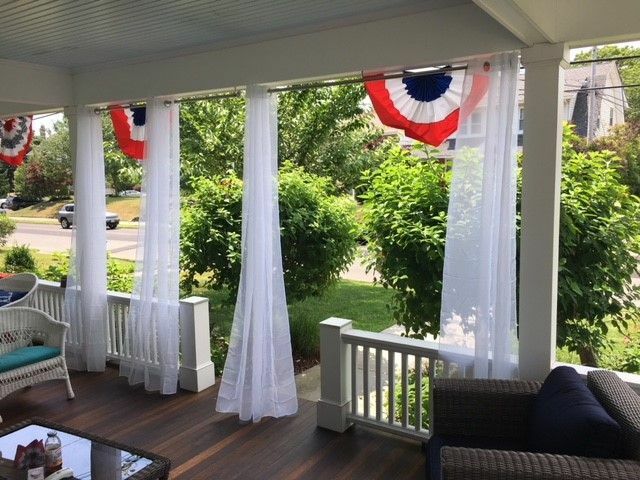 My porch is 14 years old and we only bought the house last summer. 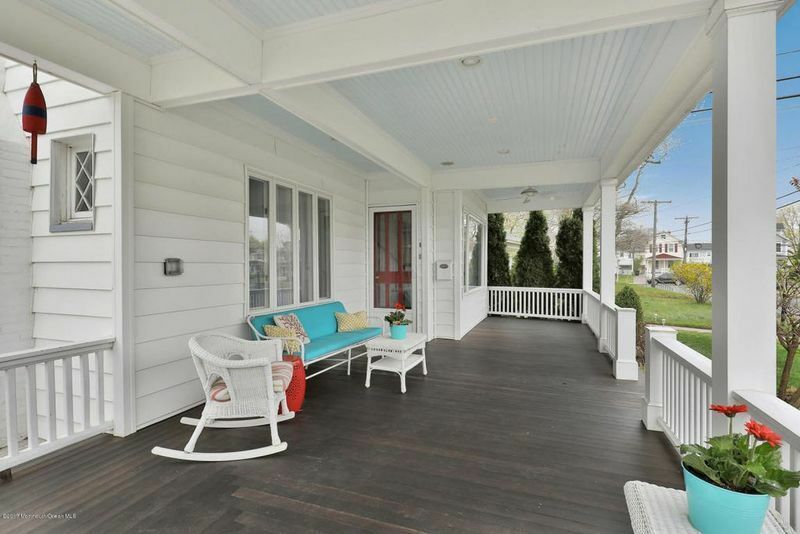 Located 4 blocks from the beach in NJ, so coastal salt-air environment. Porch is covered but western facing so gets strong late day sun. 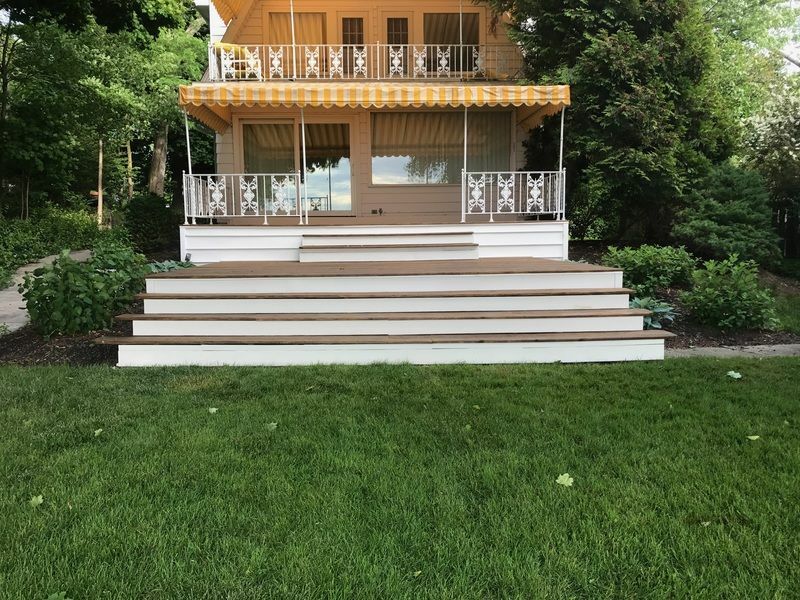 I was uncertain what finish was on the deck from the prior owner. But it appeared to be an oil based stain, and it was quite dark in color. 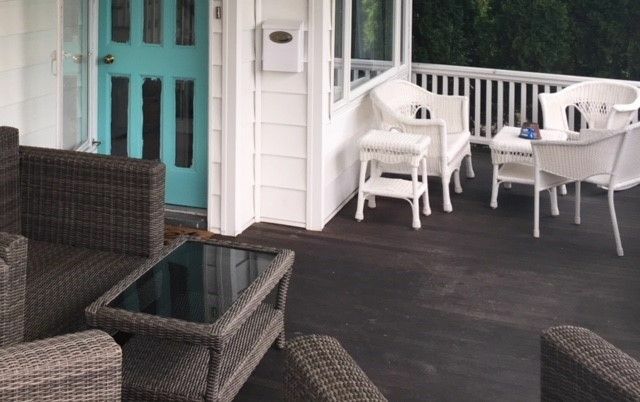 I rinsed the porch and then I used OxiClean applied with a pump sprayer. Srubbed and rinsed. Then I used a deck stripper. I used the Benjamin Moore Remove product, simply because I could find it easily. Scrubbed quite a bit. Finally I used a deck brightener container oxalic acid to lighten the wood and neutralize after the stripper. Again applied with a pump sprayer. Srubbed but much less effort than the stripper. A few small areas where still a bit dark so I sanded lightly with 80 grit on those spots. I called the number on Armstrong Clark's website and spoke to Mr. Clark himself. Very nice and helpful guy. A true gentleman. I ordered the Hardwood Amber stain product on-line and it was delivered as promised and on time. My porch is approximately 440 square feet but I ordered 2 gallons just to be sure. I applied the product using a stain brush under the railings and for cutting in near the siding. The main areas I applied using as lambs wool applicator attached to a paint pole. The one gallon JUST made it for the porch. I did my best to work so that any area I cut in with the brush was not dry when I moved to the lambs wool applicator. Overall staining was quite easy. Certainly much less effort than the wood prep process. I was careful not to let the product pool up anywhere. As directed, I did not wipe off the stain as I applied. I waited about 12 hours (directions say 24 hours but I did not have the luxury of waiting and it appeared to have been fully absorbed by the wood at 12 hours). Then I went back with clean rags and wiped off any excess. This part wasn't fun, but not because of any issues with the product...it is just a "down on your hands and knees" job. Used multiple rags for this. We then stayed off the porch for 48 hours. I then wiped off the decking one last time with one rag just to be sure there was no residual excess product left on the surface. Not much at all came up. Finally at about 60 hours post application we returned the furniture to the porch and began to use it normally. Overall, I am extremely pleased thus far with the Armstrong Clark hardwood stain. 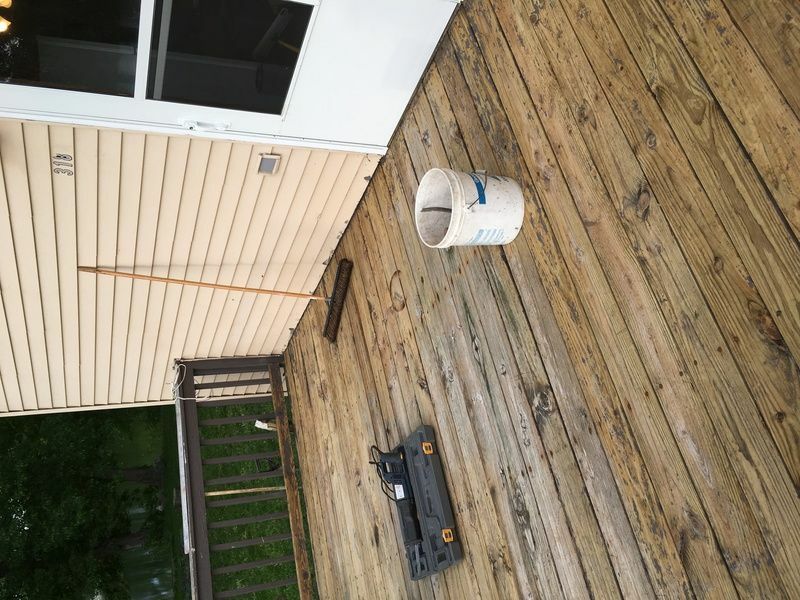 Restoring a deck or porch is a lot of work. So you hold your breath and hope for a good result after some real effort. 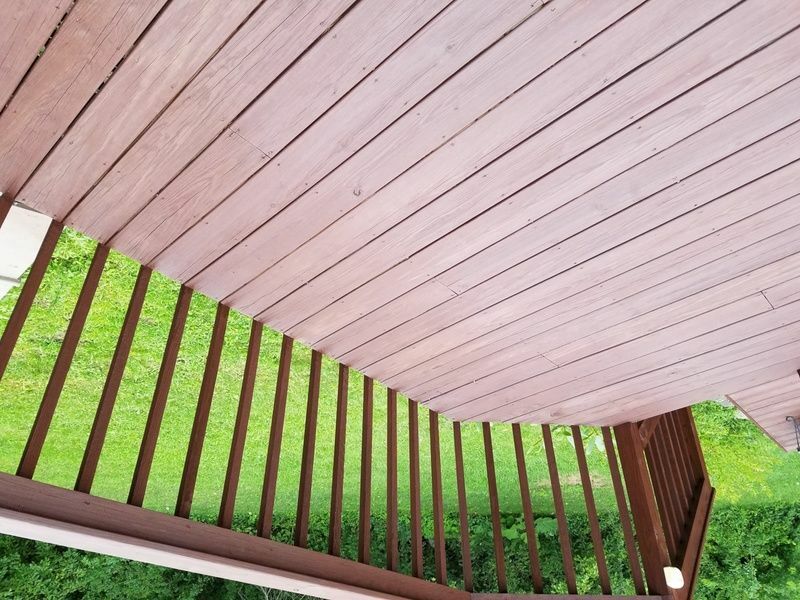 In my case, the results are fantastic so far and the color is terrific on my porch and unlike the darker color from before really shows the grain. We will see how the product holds up over time in a rough salt-air environment, but given the apparent quality thus far I am optimistic. 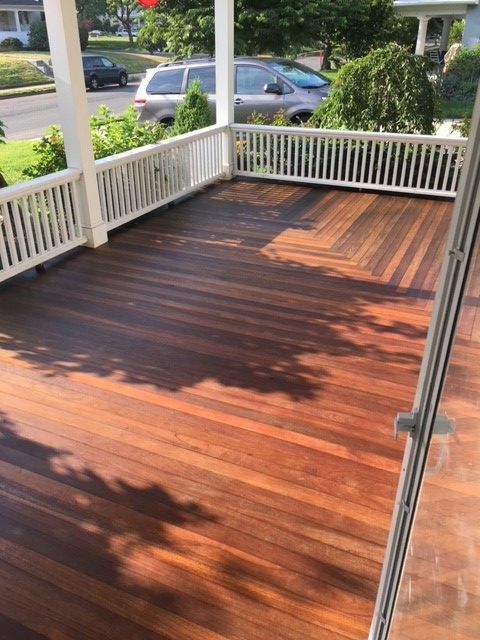 In 2016 I stained my PT deck with Cedar railings with one coat Rustic Brown. It's been 2 years and I would like to restain (7/2018). I completed light pressure washing today. Is there anything else I should do before adding an additional coat? This is great stuff! mold., mildew, dirt came right off. MUCH different process than when it was just bare wood. 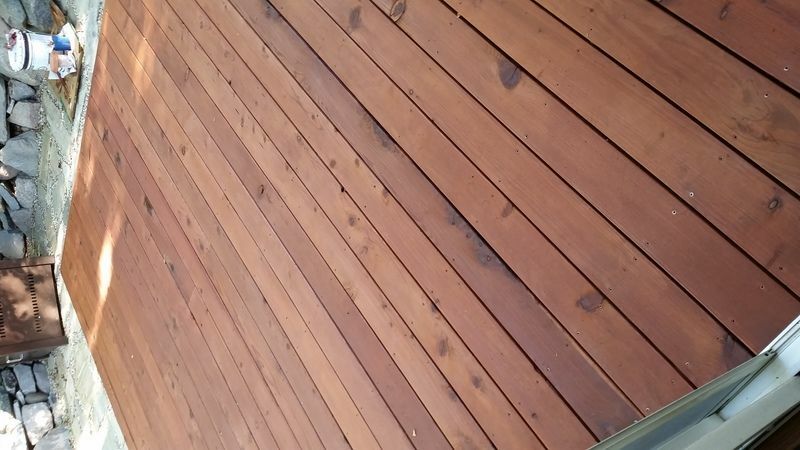 If my older Redwood deck was washed and cleaned on a Weds, and coated on a Friday would the deck surface be dry enough to place some rolling planter trays on Sat. Afternoon. I'm just about to begin staining my cleaned and brightened PT deck with Oxford Brown semi-solid. I had thought I should be planning on a wet-on-wet double coating, but the can's instructions say that does not apply to the semi-solid. Is that correct--one coat only for the Oxford?. It looks great and applies like a dream! Labor-saving is great, but I want a good finish. Many thanks. Just do the one coat for semi-solids unless the wood is very dried out. If too much stain is applied it will not absorb fully. 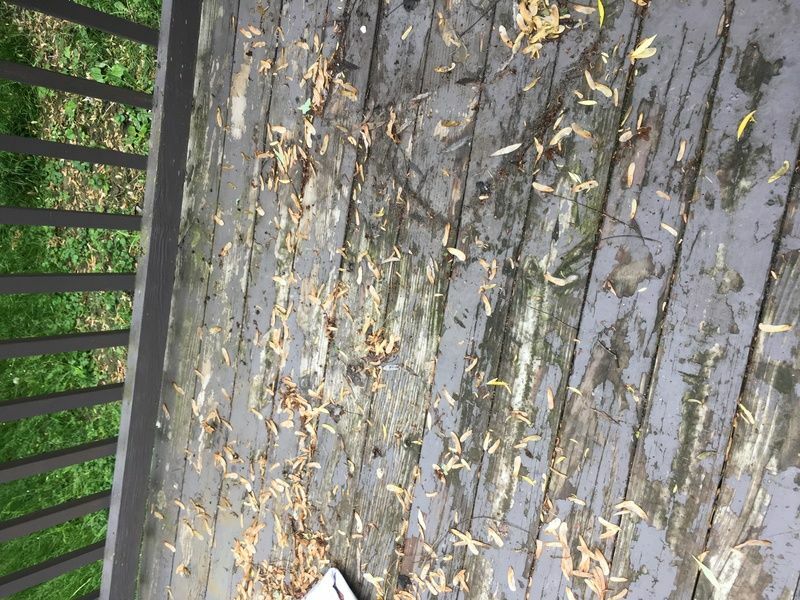 How long after staining can furniture be placed on the deck again? Typically a day or two. Just make sure the stain is fully dry and cured. I LOVE your product! I have put 1 coat on and it looks beautiful, but was wondering if I need a 2nd coat now. Redwood new 2017, sanded due to using product that did not hold up, cleaned & brightened and 1 coat of sierra redwood. Looks great! Just one coat for new wood. You can do a light coat next year if needed. I just stained my mahogany deck with Armstrong-Clark amber semi-transparent stain. 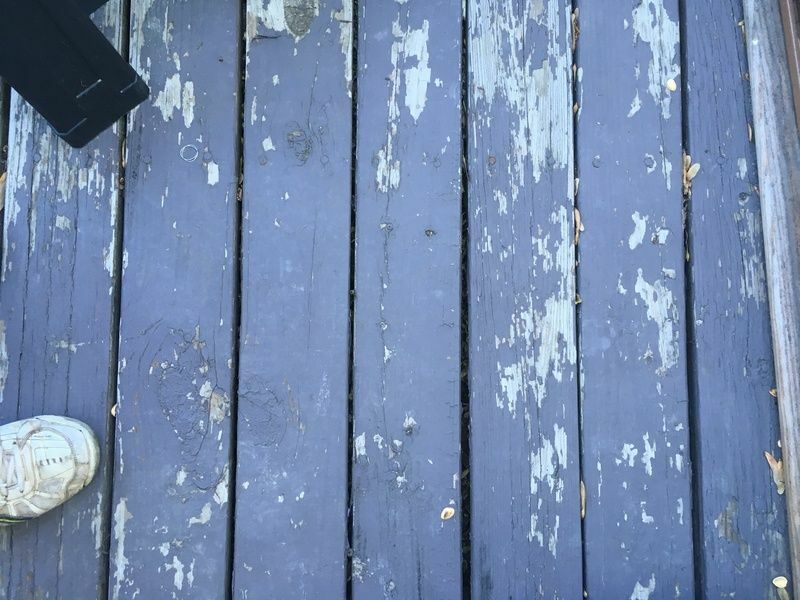 The deck was sanded prior. One coat was applied. It looks fine. Do you recommend a second coat a week after the first coat? We are in New Hampshire. No. Do a light coat next Spring for Mahogany wood. About four weeks ago, I took five days and went to Vermont to help my son recover parts of his house, purchased in August of '17, from two floods that occurred on Jan. 13 and again on Feb. 15-what has become a long and sad story. My job on this work trip, among other things, was to begin to reclaim two decks on the house, deck 1 about 120 sq ft. and deck 2 about 400 sq. ft. 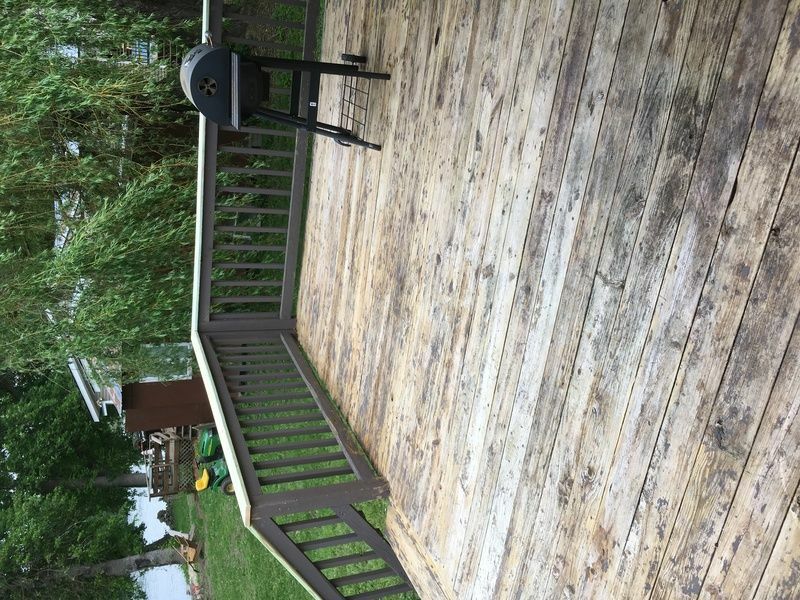 I power washed, stripped, sanded, cleaned, and brightened the decks and replaced all the railings with new pressure treated before returning home. I will be heading back to Vermont in about two weeks to stain. Several questions: 1. Will I need to clean and brighten again before staining? [I only have five days available to me.] 2. Given the overall age and condition of the wood, I am thinking an opaque stain-would you agree? 3. Can I go ahead and stain the new wood on the railings? 4. 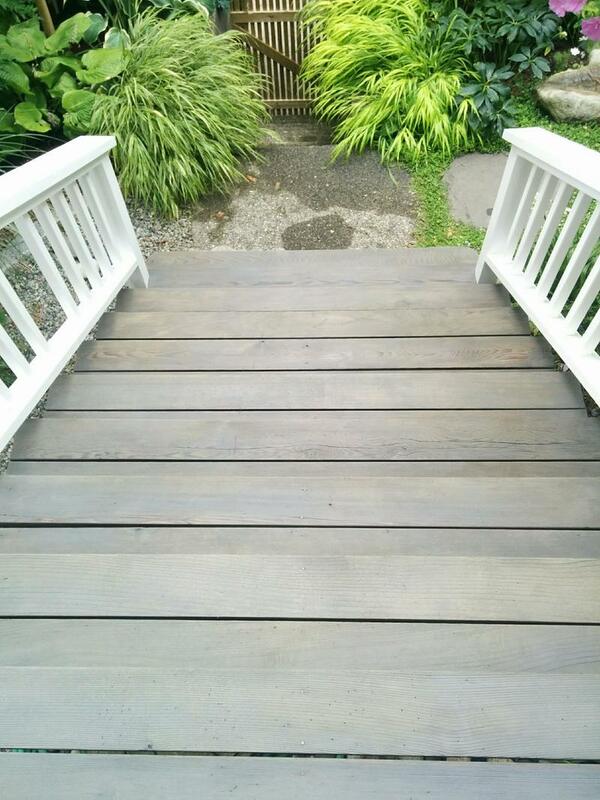 After staining, when can the surface be walked on? One must walk on the decks to get in the house and there are children, so figuring the best way to accomplish the job, given the drying time, will be a trick! I have attached photos of pre-prepped and post-prepped of both decks. Thanks. I put semi-transparent redwood on my deck yesterday evening, unfortunately it rained last night, so not sure if it fully cured. This morning some of the boards had the water beading but not all. Is it too late for a second coat or will it simply take longer to cure? Should I extend the use beyond the ecommended 72 hours? Thanks! Leave alone for now. It will most likely be fine once fully cured. Greetings. This photo was taken three days after I applied the Amber stain to my Ipe deck. Do you think this needs a second coat? I stripped the old stain and neutralized the wood before staining it. The boards on the far right are under an eave and get less direct sun and water. The other boards seem dull and show much more weathering. Your recommendations please! Looks good. If you want to add a light maintenance coat, it would be best to do this in the Spring. THIS TYPE OF WOOD IS EXTREMELY HARD..an requires the oil sealer.. I used the Armstrong Clark Amber wood stain. Is this a sealer as well? Hi there! I purchased the Semi Solid Oxford Brown Stain. Deck is prepped with Cleaner & Brightener. 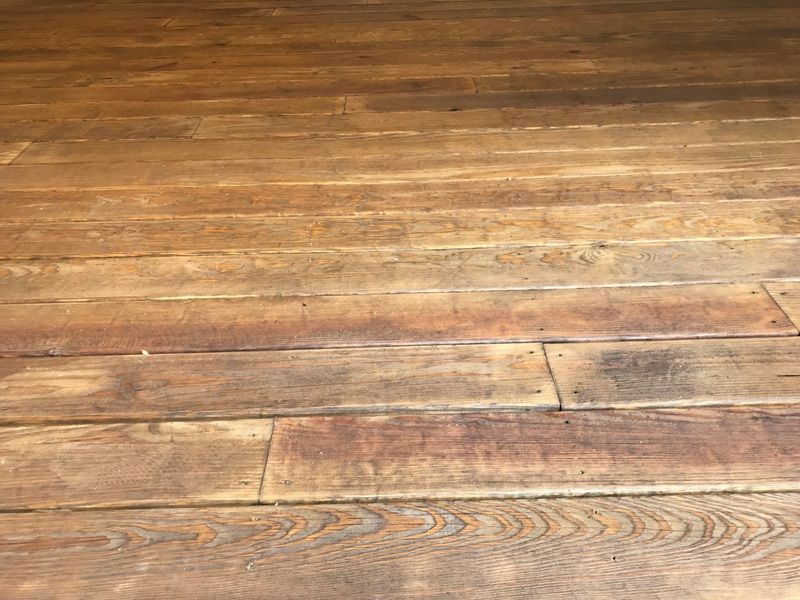 Question: how do you suggest to apply stain between floorboards? First and then roll deck......or? Yes, but you will need to do this right away. Do the edges and then immediately do the board top. So just do 2-3 only, at a time....correct? Thank you! Received your order today, great turnaround, ordered this on Monday 6/18 received on Thursday 6/21 same week. I did not see the credit for the samples on the bill. Sample order # 00024904 $16.00, regular order #0025052 $409.98. The sample order # was in the comment section of the order. I will be using a spray gun to stain the cabin but i need to know what size head (orfes) I need for the spray gun. Samples are credited to you sample order, typically the next business day and will post to your Credit card or Pay Pal account within 3-8 business days. Not sure on the tip size. 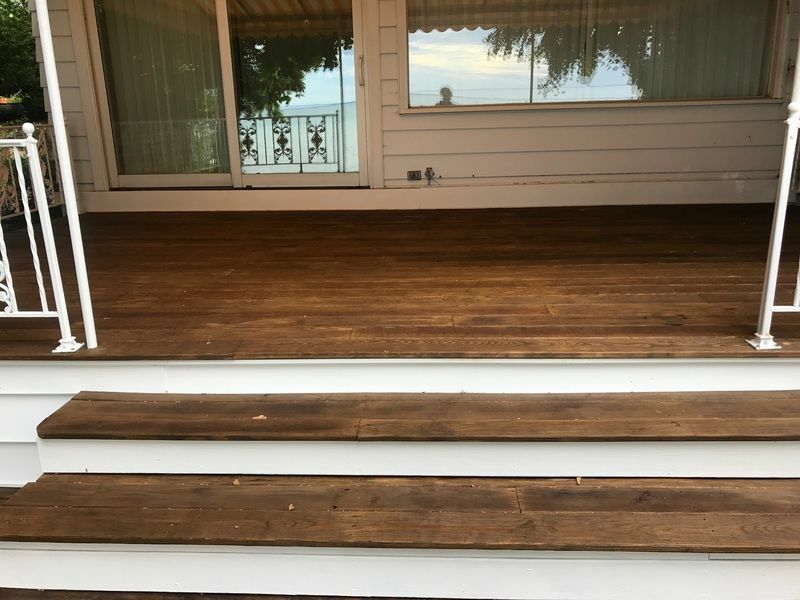 We cleaned and brightened a new deck (treated pine that dried for a year). Stained it today with black walnut - some areas really soaked it in and some are pretty dark. Should/can we apply another coat in a few days? Buffalo NY on Lake Erie. Does it change in appearance over the first day or two as it all cures? We wouldn't be able to do another coat till later in the week. Post a picture after a few days. It all looks good. Adding more could create issues with drying. Best to leave as is. You can always apply a light coat next year. PS. I should have mentioned. It is an Ipe deck and I used the Amber stain on it. Sorry for the delay. 24-48 hours is normal. 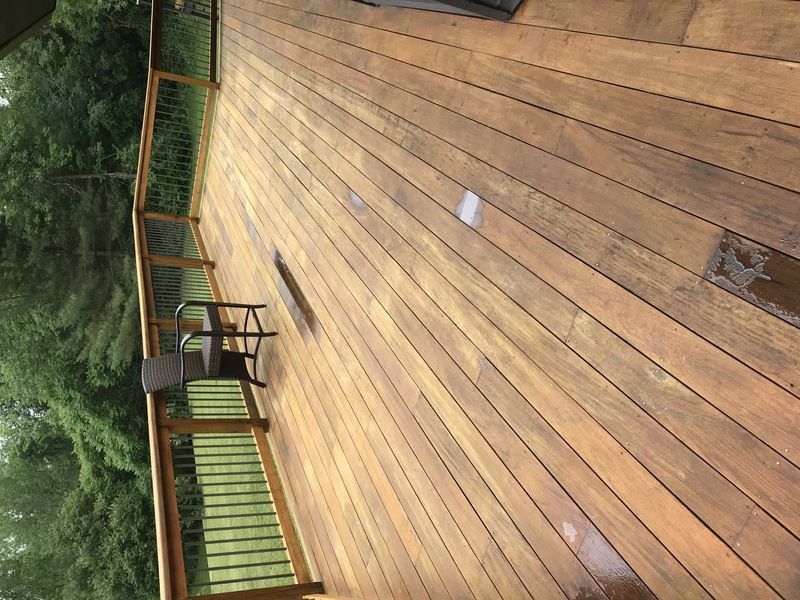 After cleaning, brightening and staining, how long should I let it sit before moving deck furniture back on and using the deck? Is 24 hours enough time? It has been in the high 70's and it feels dry to the touch. No stain comes up on a paper towel pressed against it. Sorry clicked post before adding Picture, picture in this one.